If you have read the series on Taking Better Macro Shots (link to the 1st article of the series here: Choice Of Subjects) in this site, you would know that lighting is a core component to better macro photographs. Regardless of photography genre, most require the use of good quality soft light in order to produce flattering final images that are nice to look at (in contrast to harsh light and shadows that we often see while using compact digital cameras). 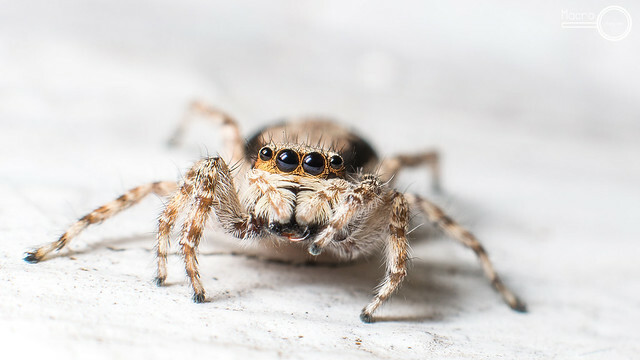 A male jumping spider. Your path to taking great macro photos relies very heavily on light diffusion. In Macro Photography, the only way to get there is to design and build your own DIY diffuser. 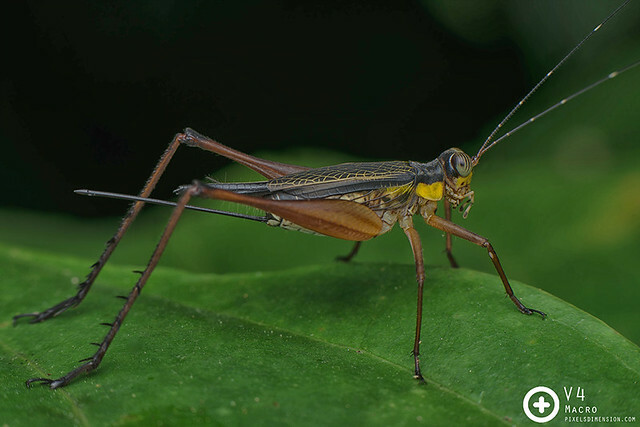 As covered in Using Flash In Macro Photography, we know that flash cannot be avoided if you want good macro photographs as it helps to keep photos sharp and detailed. The trick here is of course, on how to diffuse the light for better photos. Poor diffusion. This was one of my first flash macro shots, taken directly with my SB700 + bounce card. The lack of diffusion resulted in very harsh lights and shadows- not very pleasant to look at. That said, things become complicated since Macro Photographers prefer the flash to be compact i.e. integrated into the macro rig itself; unlike in Portrait Photography where dedicated light stands can be placed anywhere you want. Maintaining portability and weight is the main challenge in designing a macro rig with great light diffusion. 1. Stock diffusers just don’t cut it. The flash diffusers, be it 1st or 3rd party ones are designed to work for “normal” photographic shots i.e. portraits, wedding shots, where the distance of the subject is large. 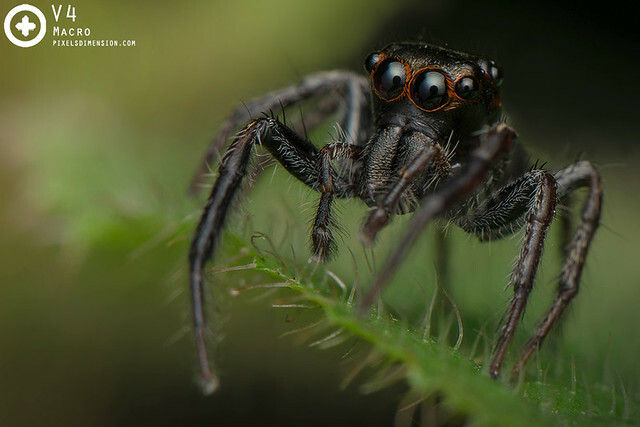 Macro Photography requires the flash to be right up onto the subject’s face, which becomes a big problem since stock diffusers don’t diffuse enough to produce the desired softness of light. Most stock diffusers are often wrong in terms of dimensions as well- too big, too small, too long, too short etc. These are the reasons why most will resort to DIY diffusers, they are more effective, and they give you a chance to show off your creativity as well. Maybe, just maybe one day the manufacturers will decide to come up dedicated light diffusing systems for Macro as well. 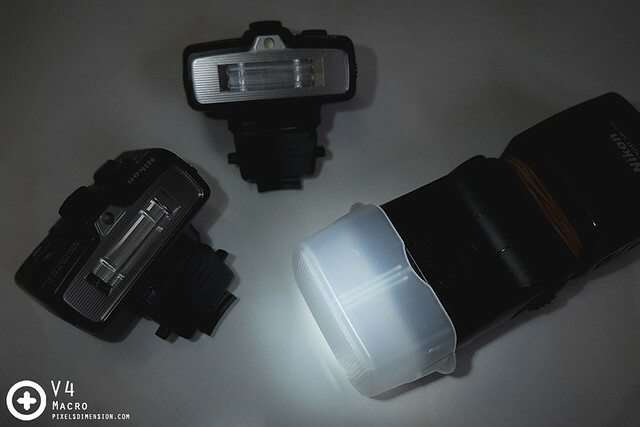 Stock flashguns and diffusers are designed for larger subjects (e.g. humans) taken from a farther distance, and will tend to produce harsh lights when used for Macro Photography. This is why DIY diffusers are needed for better images. 2. There are no fixed BEST diffusers or Macro Rigs. One should understand that different photographers have different expectations towards their macro setup: Some may be willing to go for a heavier setup so long as the light diffusion is excellent, whereas others prefer lighter, and more flexible setups at the expense of performance. The way and the things you photograph will thus affect the size and design of the diffuser you choose for your rig. Your macro rig might be the best for your usage, but it might not be the same for others, which is why you can try to imitate flash diffusers designed and used by Pros within the field, but still not getting similar results as they do. 3. Light diffusion depends on many factors. Material used– different substances i.e. 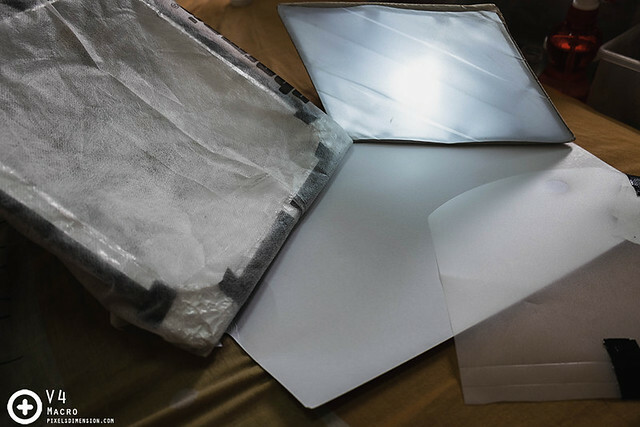 soft fabric, polystyrene or polyethylene foams, paper, plastic bags have different ways of diffusing the light passing through them, resulting in different quality of light. 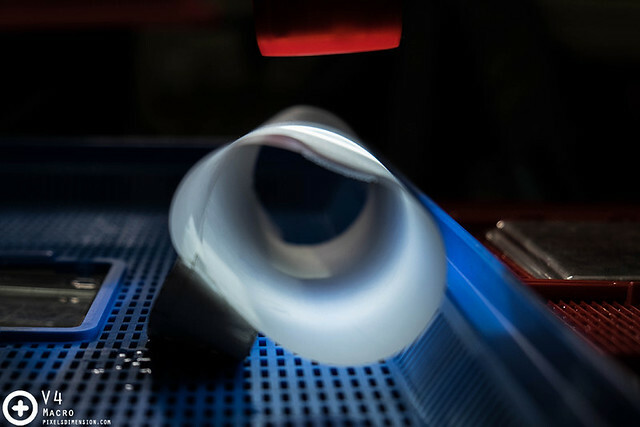 Polyethylene foams appear to be some of the best materials for diffusion due to the somewhat rough surfaces that helps spread light better. Of course, there may be other alternatives out there, and only through trial-and-error will you be able to find out which materials are the best for you. Different materials offer different quality of light diffusion, and it relies on some trial-and-error to find out which works the best for you! Amount of diffusers– The amount of diffusers (not necessarily made of the same materials) you use will affect the final quality and direction of light as well, since one diffuser alone might not be enough for the task. Effective surface area– The larger the surface area of your diffuser, the more the spread and softness of light. This is the main reason why Macrographers don’t just use flashguns directly for shots. This is also the reason why most use large studio umbrellas (instead of just firing flash directly) for professional portrait shots. Direction of light– The direction of light is important if you are to channel enough light onto the subject without it being too harsh. The light is often harsh if fired directly onto the subject, even with diffusers. Conversely, bouncing the light, on top of diffusion, will effectively reduce harshness. Additionally, photos will look better if light is channelled evenly onto the subject from different directions (the more the directions, the better as it will cancel out shadows). The shape of your diffuser will determine how light is channelled, which may work for, or against you. Properly planning is thus required in the designs. Shape of diffuser– the shape of your diffuser will affect the reflections off reflective parts of your subjects e.g. 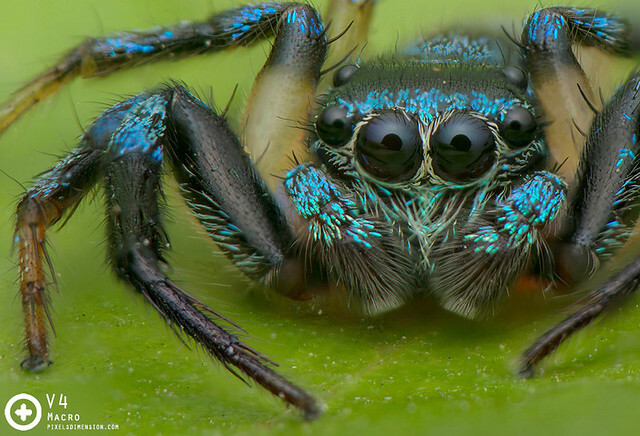 eyes of jumping spiders etc. Choosing different shapes might affect the effective surface area of your diffuser (for example a round diffuser has less surface area compared to a squarish diffuser), thus also affecting softness and spread of light. The shape of your diffuser also determines how you channel your light onto your subjects. Flash power– The more powerful your flash is set at, the more diffusion is required to soften or spread the light. The key is to balance diffusion and flash power for a properly exposed macro shot, without wasting unnecessary battery power. For example, if you could get a similar light softness by (i) Firing flash at full power using 5 diffusers and (ii) firing flash at 1/16 power with 2 diffusers; always go for the more power efficient one. Most of these factors can be easily designed, applied and improved one-by-one. It is often the connection in between one another that is the challenging part. After all, who doesn’t want a power efficient performance macro rig? 4. The amount of light and diffusion require changes at different magnifications. Macro Rigs designed optimally (settings, flash, diffusion) for Extreme Macro Photography may have problems photographing large or distant subjects due to the flash not having enough range. A higher flash power (or different DSLR settings) are required to photograph larger or farther subjects. The settings used here are usually not suitable when you switched to photographing tiny but very up-closed subjects. Similarly, setups suitable for distant subjects might result in harsh or overexposed images when taking up-closed shots. A highly magnified male Fighting Spider; note the magnificent metallic green scales on the body. A different set of DSLR and flash settings are required for extreme shots. Of course, it is virtually impossible to design one single setup with light and diffusion suitable for all situations, so one should bear in mind to adjust flash or camera settings whenever changing magnifications; or design two different setups for both up-closed and distant shots. 5. Cheap materials don’t mean they are bad. 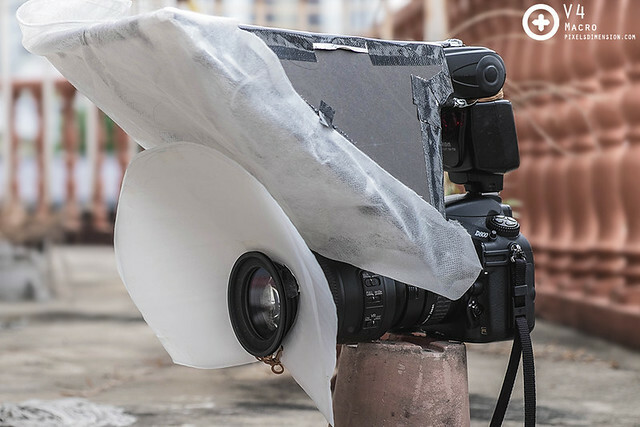 Unlike most goods out there; when it comes to DIY flash diffusers, some of the best materials are sometimes the cheapest! In fact, some may be so common that you might have problems finding some. Most of the stuffs required to build an effective diffuser can be found among normal households, it just takes a little bit of effort and creativity to get you there. In fact, I have seen some DIY diffusers out there that are so darn impressive that you just got to salute the creator for his efforts! 6. Light leak is light lost. A good light diffusion system is one that is efficient in both lighting and power saving. 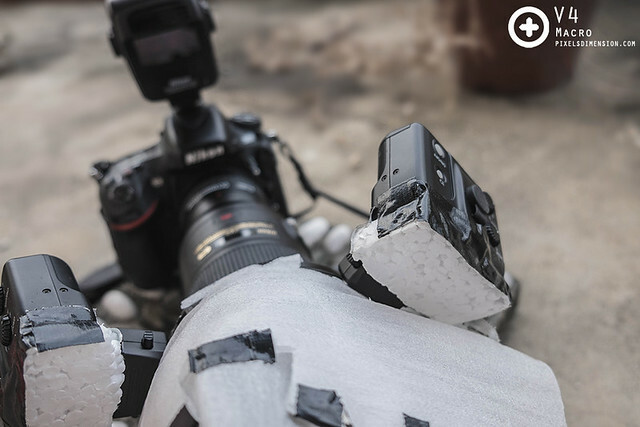 Due to the nature of DIY components- most of which are adhered together by means of tapes and super glue, often there will be minor crevices or holes in which light might escape, leading to loss of light. Therefore, it pays to put in more craftsmanship to produce a higher quality diffuser. The usage of reflective materials i.e. aluminium foil will also help reflect and channel light out of the diffuser with minimal loss of light. Similarly, as pointed in Point (2), the material used for diffusion will affect the efficiency of your system as well. 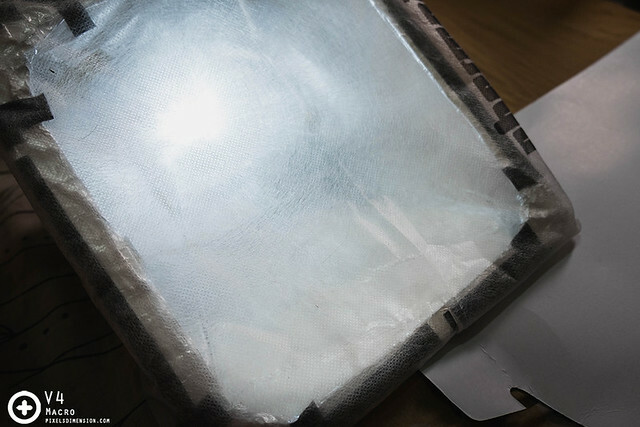 Aluminium foil linings within this DIY diffusers help reflect and channel light properly from the source to the subject, with minimal light loss or leaks. A macro system that is not power efficient will drain the battery of your DSLR and flashgun faster. Of course, if you have to shoot at very high flash power due to the mediocre diffusing system, the recharge time for the flash will be affected (not capable of burst shots). This will not only affect battery consumption, but also the quality of your shots. That said, unfortunately the designing and building of a better diffuser system is a continuous process: you can’t get it perfect in just one try. You will have to test your systems one by one, and make necessary adjustments to improve the system; and more often than not, the macro rig you are using will evolve according to your macro skills. Anyway, you can find the progression of my macro systems or perhaps gain some ideas here if interested: My Macro Rig. My current Macro Setup (Mark VIII)- Came a long way in terms of light diffusion. Still, this setup is far from perfect, with several drawbacks to attend to. For details of my macro setup, please read here: My Macro Rig. Okay, I have listed the 6 things you should know about DIY Flash Diffusion. Unfortunately it is not easy to show you guys how to make a DIY flash diffuser via text, what’s more you might be using a different setup than I am, so this is the best I could do for now. If you have any suggestions, please feel free to share them, after all, no DIY diffuser is perfect, there is always new things to improve! Thank you for reading and have a nice day ahead!